Jorge Luis Borges’s “Kafka and His Precursors” begins oddly: “I once premeditated making a study of Kafka’s precursors.” The use of the verb “premeditate” is odd enough, in the Spanish (“Yo premedité alguna vez”) as much as in the English, not least because it is most usually found in juridical discourse: a premeditated crime is one that is considered and planned in advance, as opposed to a crime of passion or an outburst in the heat of the moment. This strange invocation of legal discourse might suggest that some wrong-doing is afoot, or that we are hearing some kind of confession. And yet–and this is the second strange aspect of Borges’s opening gambit–it is also suggested that the crime was never committed. “I once premeditated making a study” implies that the study remained unwritten or unmade; it was only planned. We have the guilty mind (mens rea) but not the guilty act (actus reus). The crime was averted, perhaps because some flaw was found in what was otherwise a perfect plan. But this then leaves us asking ourselves about the status of the text that we have before us, which (as the title promises and as further readings confirms) turns out to concern precisely the topic of the projected but unwritten or abandoned study: “Kafka and His Precursors.” Yet if this is not that study (perhaps because it is too short, incomplete), nor is it the premeditation of that study: at best it is an account of that premeditation, a summary and reflection upon the preparatory “notes” that would have aided in the writing itself. It is an intervention between the plan and its execution, between intention and act. In short, the text that we have here is perhaps triply parasitic, or three-times removed from its ostensible object: it is the summary of notes towards a study of Kafka and his precursors. It is also strangely located in time: it is the reflection on a plan in the past to write a study that is still unwritten (and so is postponed to the indefinite future) about a now-dead author and his precursors that (we soon find) proceeds by enumerating them “in chronological order,” beginning with the most far-distant. As often in Borges, the part mimics the whole or (perhaps better) we find an almost fractal arrangement in which patterns are repeated at various orders of magnitude, albeit to produce less the comfort of familiarity than a vertiginous sense of the uncanny and a shattering of logic. Elsewhere, we see this effect in his description of the “aleph,” a shimmering ball (found in the banal surroundings of a Buenos Aires basement) that contains within itself the entire universe. But Borges also suggests that such apparent oddities (or impossibilities) are remarkably common, even quotidian: think long and hard about anything, and it soon becomes (or is revealed to be) an aleph of its own. Here, these opening lines anticipate the central problematic of the essay itself, which is about the ways in which texts are related and how strange fissures or reversals upset linear temporality, just as it in turn makes (or unmakes) its point through performance as much as through argument or exposition: for this text about Kafka and his precursors is in its own way about Borges and his precursors and in it Borges himself rewrites our collective past and disturbs our conceptions of sequence and priority. Finally, if what Borges is ultimately saying is that a writer (that writing) has the strange power to intervene in history, to remake or remodel the past just as Kafka creates his own precursors (by making us see an otherwise disparate collection of historical texts as oddly “Kafkaesque” avant la lettre), he is also unabashedly claiming that there is nothing new in this notion. This observation precedes Borges and this text, and so confirms (what is now) his repetition of what can present itself as an established fact. For in another detail, a footnote–a classic paratext or parasite, neither fully part of nor fully detached from the text itself–draws our attention to T S Eliot’s Points of View, whose very title in this context becomes simultaneously uncanny and revelatory. After all, is this entire essay not about “points of view,” and the ways in which they are constructed, obscured, or undermined? In a rather good essay on Joyce and Borges Patricia Novillo-Corvalán, whom I am here myself copying or appropriating to some extent, notes that “Eliot postulates an aesthetic principle, through which writers are not read in isolation, but as part of a living tradition in which the new alters the old, the present modifies the past and, as a result, texts are continually re-valued from the perspective of subsequent texts” (60). 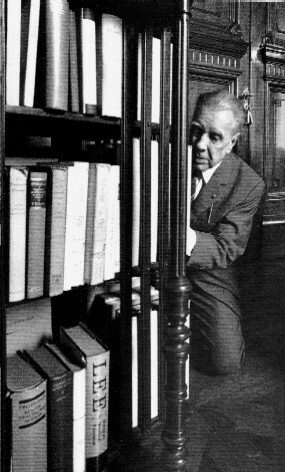 And Rex Butler’s “Everything and Nothing” points out that what makes Borges original–what makes the greatest authors the most original–is precisely the fact that they “can actually appear unoriginal, to add nothing to literature, to repeat what has already been written” (134). At which point, as I observe that I in turn am in large part simply “repeat[ing] what has already been written,” remaking and remodeling it for my own purposes, creating precursors who sadly are not quite as disparate (or quite as unpredictable) as those of Borges and Kafka, perhaps it’s time to stop what is after all only a first approach to these issues. It’s time to end, in other words, so that we can at last begin. Interesting post. I find it especially interesting that you note the piece is three times removed from the ostensible object, if only because my own thoughts regarding Camus’ “Myth of Sisyphus” also suggest a movement in threes. Maybe Hegel strikes again? I think its important to note the effect that remaking has on history (such that we look back and find a collection of pieces to be ‘Kafkaesque’ despite the fact that they were written before Kafka and only become linked after their own time). But I’d also like to spend time discussing the percieved legitimacy of this remaking of history. Is it fair to call something ‘Kafkaesque’ if it predates Kafka? Is it fair to call someone a feminist if s/he predates the feminist movement? What is the relationship between remaking and distorting? I don’t have answers at present, but am looking forward to considering these and other questions in the coming term. As for the question of legitimacy, that’s an important one, I think. But that’s why history is also a battleground for struggles in the present: political struggles are often about making and remaking the past. I think we’ll get into this when we approach history more directly, not least with Trouillot’s book. Yesterday, I was also realizing that we could usefully have set Hobsbawm’s The Invention of Tradition, perhaps the introduction at least. On a completely different note, there are 2 pieces on Open Access, MOOCs, etc. and their interrelationship with the privatisation of universities in the latest Radical Philosophy that you might find interesting. They provide a more rational justification for my instinctive mistrust of such developments beyond my own technophobia. Thanks, Jezzer, will check that out!